Donald Trump is the 45th president of the United States of America. Hillary Clinton has called Donald Trump to concede the race, according to CNN. UPDATE: 9:10 am Hillary Clinton is reportedly sending her supporters home. 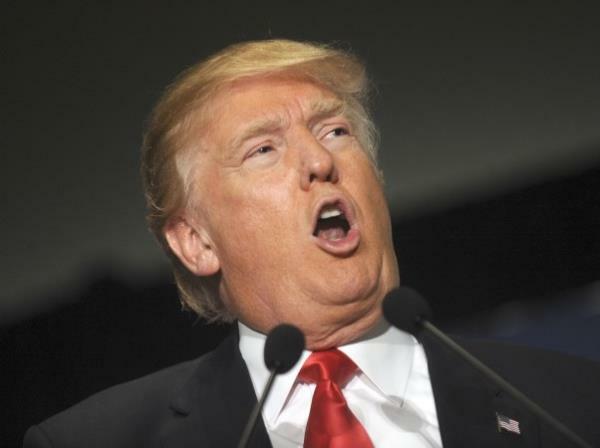 Donald Trump needs just six electoral votes to win the 2016 US Presidential Election. 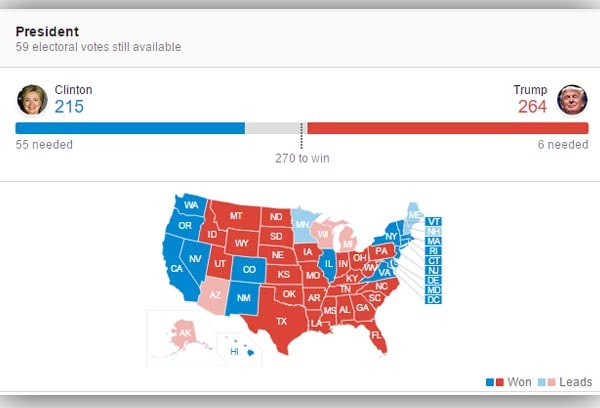 According to Google's live results, Trump currently has 264 electoral votes. This after Trump took key battleground state of Pennsylvania with its 20 electoral votes. Pennsylvania last voted for a Republican for president in 1988, News24 reports. Trump repeatedly campaigned there, believing his populist message would resonate with the state's working-class voters. UPDATE: 8:22 am Trump is still in the lead. Eight states are still too close to call including Michigan, Pennsylvania and Wisconsin. They're vital to Clinton's fading chances of victory, News24 reports. The others are Alaska, Arizona, Maine, Minnesota and New Hampshire. Donald Trump has taken the lead in the polls, after gaining ground in Iowa and Georgia. However, the outlet is predicting Trump will win Florida, earning him 29 more votes. UPDATE: 6:10 am Hillary Clinton has won California. This means Clinton is again leading in the polls, with 190 votes to opponent Donald Trump's 171. As at 5:45 am: Donald Trump has won the key battleground state of Ohio -- shortly after, Hillary Clinton won Virginia. But the former reality TV star is currently ahead of his opponent in the race for the White House. 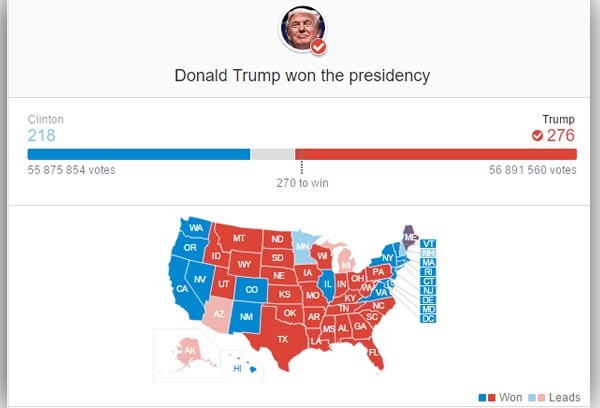 According to CNN, at just before 6 am SA time, Trump was currently at 167 electoral votes to Clinton's 131. 270 votes are need to win. However, Bloomberg is predicting Trump will win Florida, another major battleground state -- which would take Trump to 197 votes.